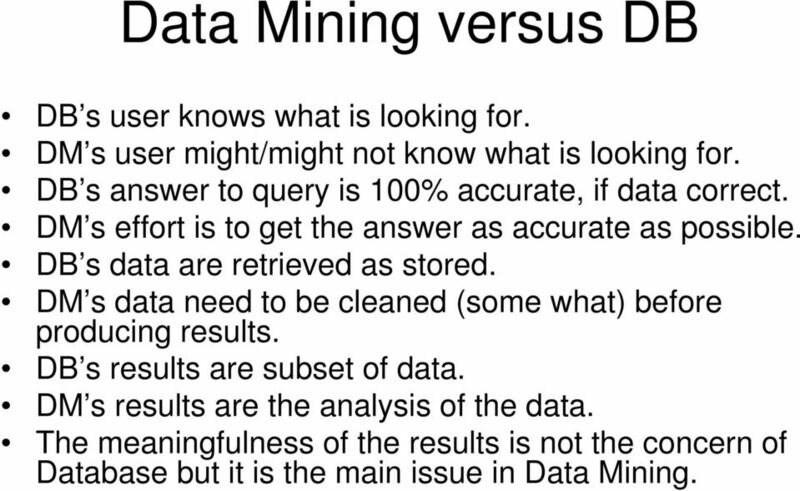 5 Data Mining versus DB DB s user knows what is looking for. DM s user might/might not know what is looking for. DB s answer to query is 100% accurate, if data correct. DM s effort is to get the answer as accurate as possible. DB s data are retrieved as stored. DM s data need to be cleaned (some what) before producing results. DB s results are subset of data. DM s results are the analysis of the data. The meaningfulness of the results is not the concern of Database but it is the main issue in Data Mining. 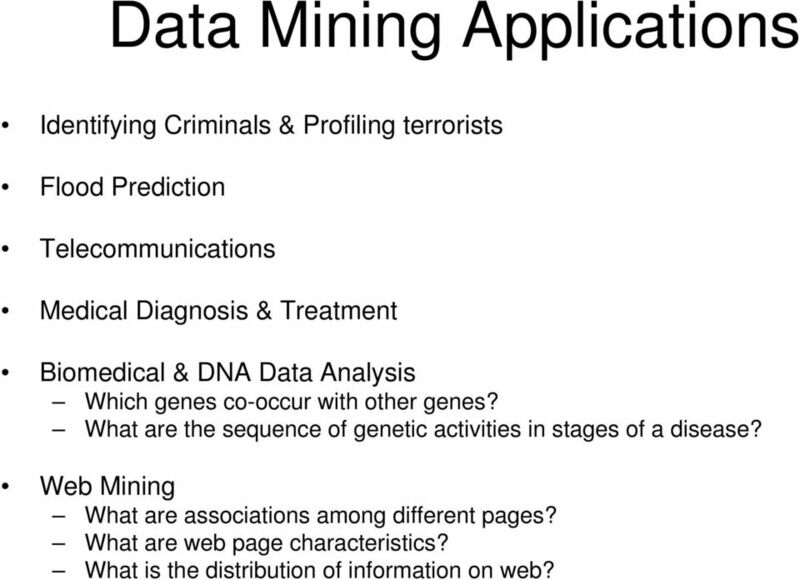 7 Data Mining Applications Identifying Criminals & Profiling terrorists Flood Prediction Telecommunications Medical Diagnosis & Treatment Biomedical & DNA Data Analysis Which genes co-occur with other genes? What are the sequence of genetic activities in stages of a disease? Web Mining What are associations among different pages? What are web page characteristics? What is the distribution of information on web? 9 Privacy Issues DM applications derive demographics about customers via Credit card use Store card Subscription Book, video, etc rental Phone and web usage Cell phone geographic information and via more sources As the DM results are deemed to be a good estimate or prediction, one has to be sensitive to the results not to violate privacy. 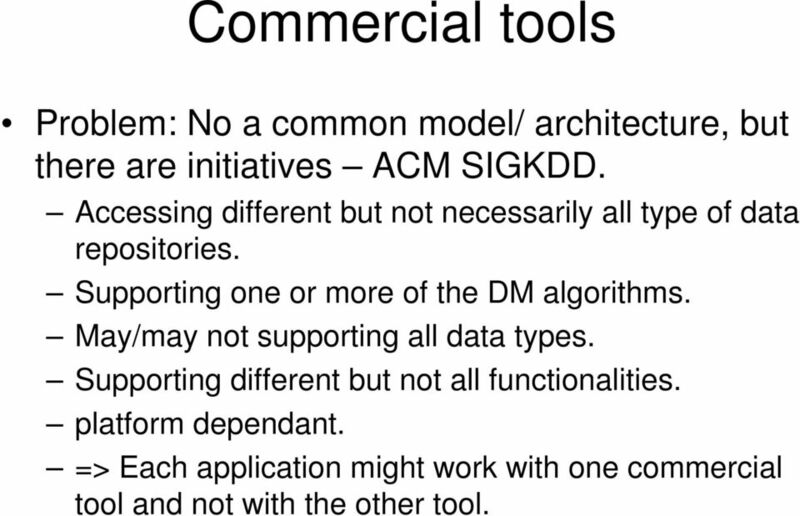 10 Commercial tools Problem: No a common model/ architecture, but there are initiatives ACM SIGKDD. Accessing different but not necessarily all type of data repositories. Supporting one or more of the DM algorithms. May/may not supporting all data types. Supporting different but not all functionalities. platform dependant. => Each application might work with one commercial tool and not with the other tool. 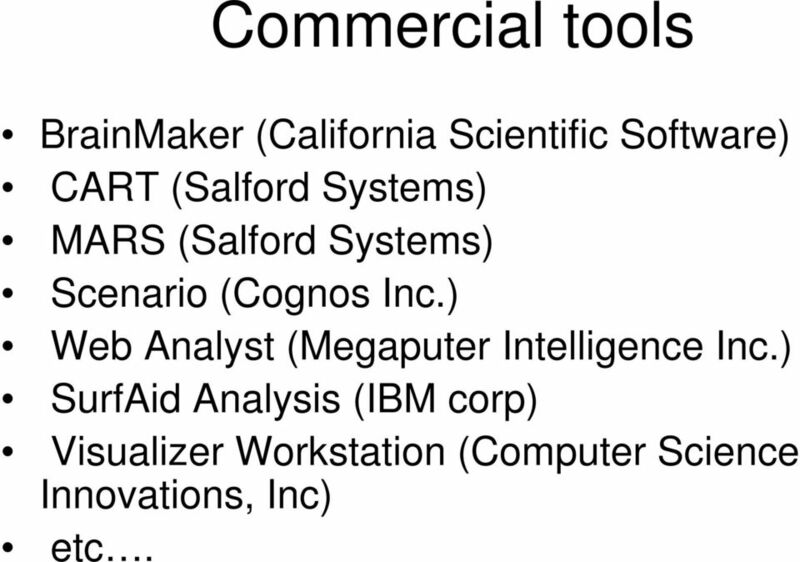 12 Commercial tools BrainMaker (California Scientific Software) CART (Salford Systems) MARS (Salford Systems) Scenario (Cognos Inc.) Web Analyst (Megaputer Intelligence Inc.) SurfAid Analysis (IBM corp) Visualizer Workstation (Computer Science Innovations, Inc) etc. 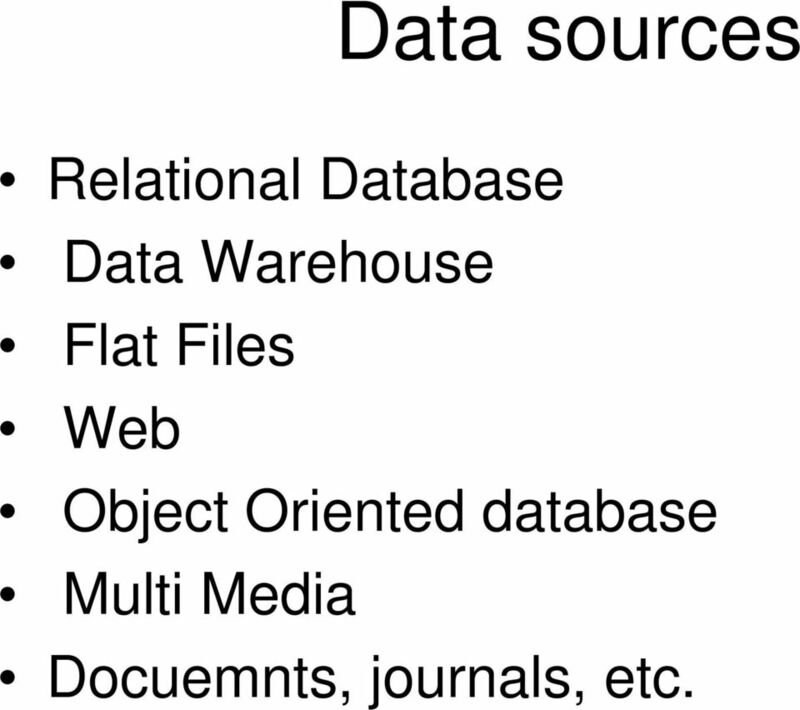 13 Data sources Relational Database Data Warehouse Flat Files Web Object Oriented database Multi Media Docuemnts, journals, etc. 14 Data warehouse (cont.) To improve the performance in DW different techniques such as Summarization and Denormalization are used. Usually but not always DW is accessed by On-Line Analytical Processing (OLAP) query. SQL gives a precise answer to a user query. OLAP gives a multi-dimensional view of data and is as extension of some aggregate functions in SQL. OLAP Operations are Slice, Dice, Roll-up, and Drilldown. 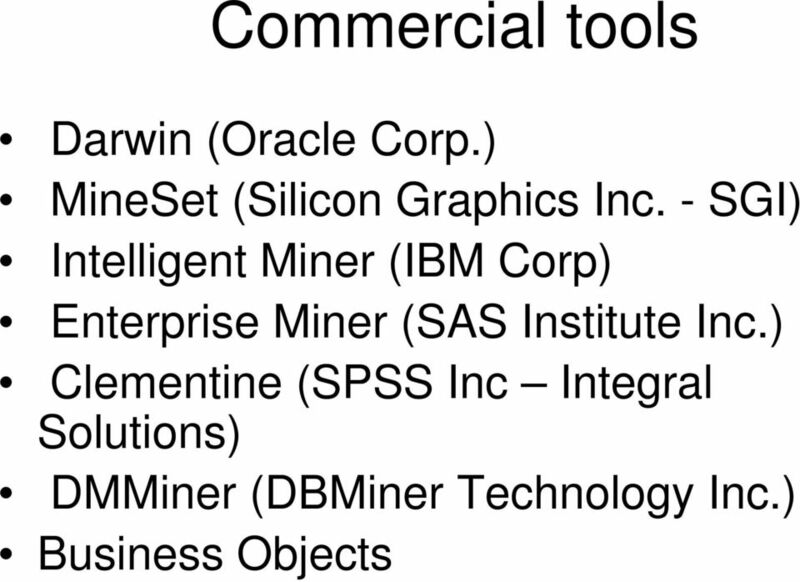 15 Data warehouse (cont.) OLAP is a data summarization/ aggregation tool that facilitates the data analysis for the user by providing a multi-dimensional view of the data. Data Mining Tool provides an automated discovery of knowledge and gives more in-depth knowledge about data and hidden information. 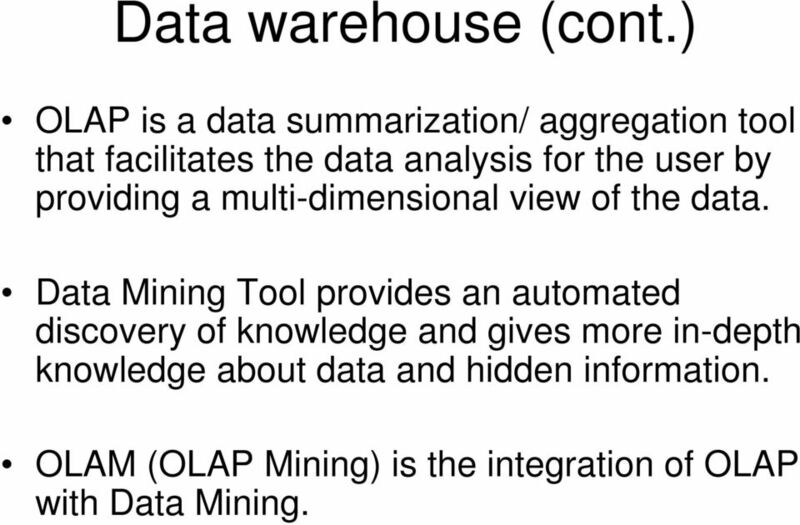 OLAM (OLAP Mining) is the integration of OLAP with Data Mining. 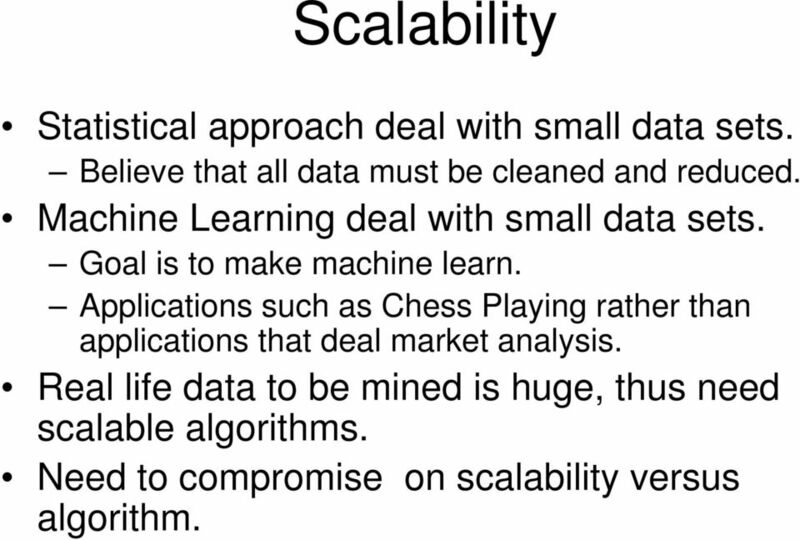 18 Scalability Statistical approach deal with small data sets. Believe that all data must be cleaned and reduced. Machine Learning deal with small data sets. Goal is to make machine learn. Applications such as Chess Playing rather than applications that deal market analysis. Real life data to be mined is huge, thus need scalable algorithms. Need to compromise on scalability versus algorithm. 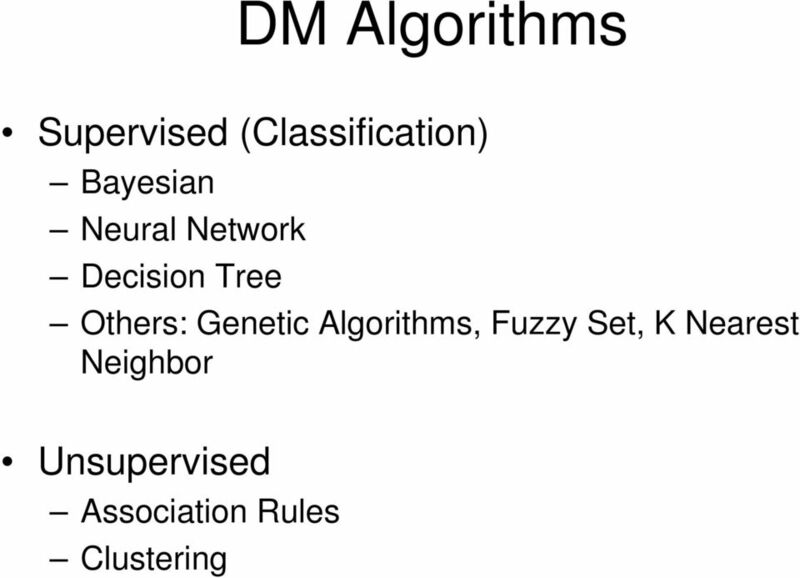 20 Supervised vs. Unsupervised Supervised algorithms Learning by example: Use training data which has correct answers (class label attribute) Create a model by running the algorithm on the training data Identify a class label for the incoming new data Unsupervised algorithms Do not use training data. Classes may not be known in advance. 22 DM Evaluation Metrics Not always straightforward. ROI (Return on Investment) used in business to measure benefit of using Data Mining. Lift Chart used to visualize and measure response modeling performance. Traditional Computer Science evaluation metrics are space requirement and time complexity to compare the algorithms. Measuring accuracy of DM results: Use of Cross-Validation in Supervised algorithms. Information Retrieval measures of Precision & recall. Various accuracy measures based on each algorithm. 24 Cross Validation Goal: We want to measure the effectiveness of a classification (supervised) algorithm. Take the training dataset Build model Test using the training dataset This usually leads to a very optimistic result that has little ability to predict the real accuracy of the model. 25 Cross Validation Another approach is to take the training data set, cut it in half and use half on training and half for testing. This leads to potential errors in estimating the real classification rate because the half we hold for testing may be very different that the half we used for training. 26 10-fold Cross Validation Take the data set and use the first 90 percent of the data for training and then test on the final ten percent. Then use the next 10 percent for testing, etc. 27 10-fold Cross Validation Each run will result in a particular classification rate. Ex: If we classified 50/100 of the test records correctly our classification rate for that run is 50%. Choose the model that generated the highest classification rate. The final classification rate for the model is the average of the ten classification rates. 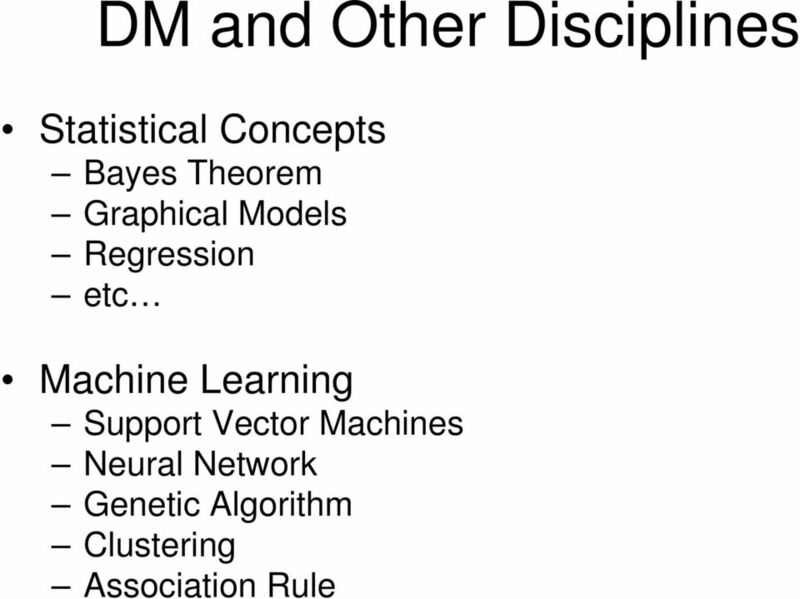 28 Summary Data Mining algorithms are used to detect the information that we do not know. 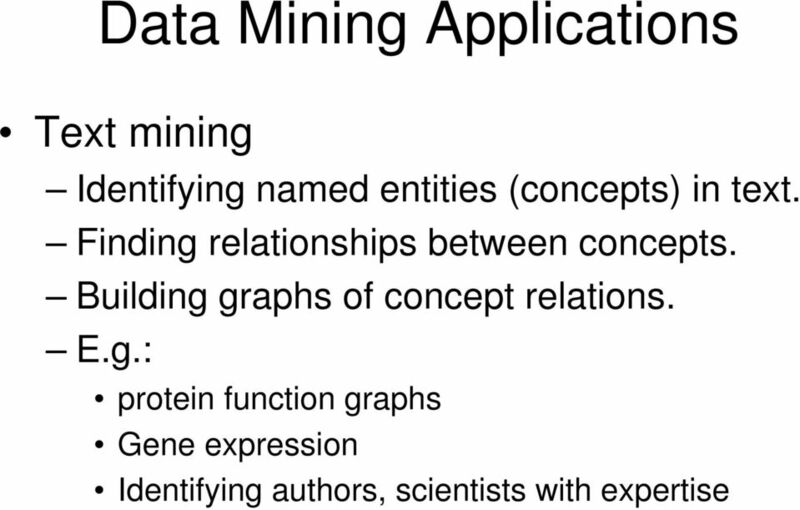 There are various data sources, types,formats and applications for Data Mining. 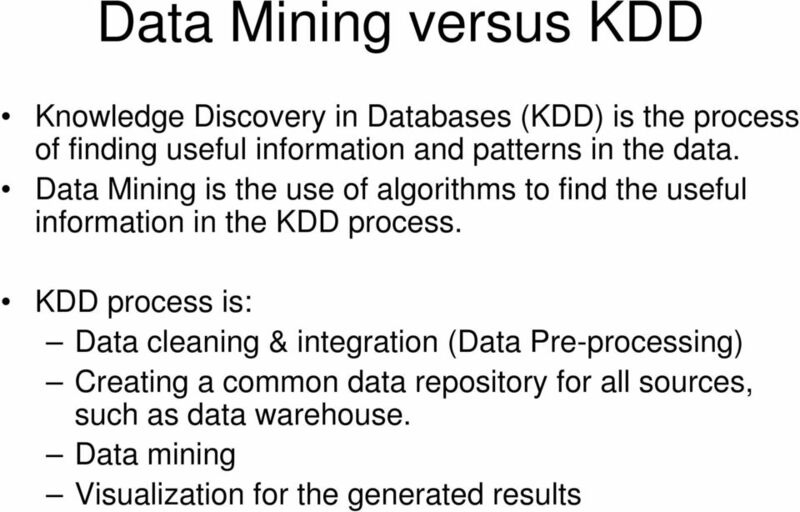 Usually Data Mining is used on a Data Warehouse. 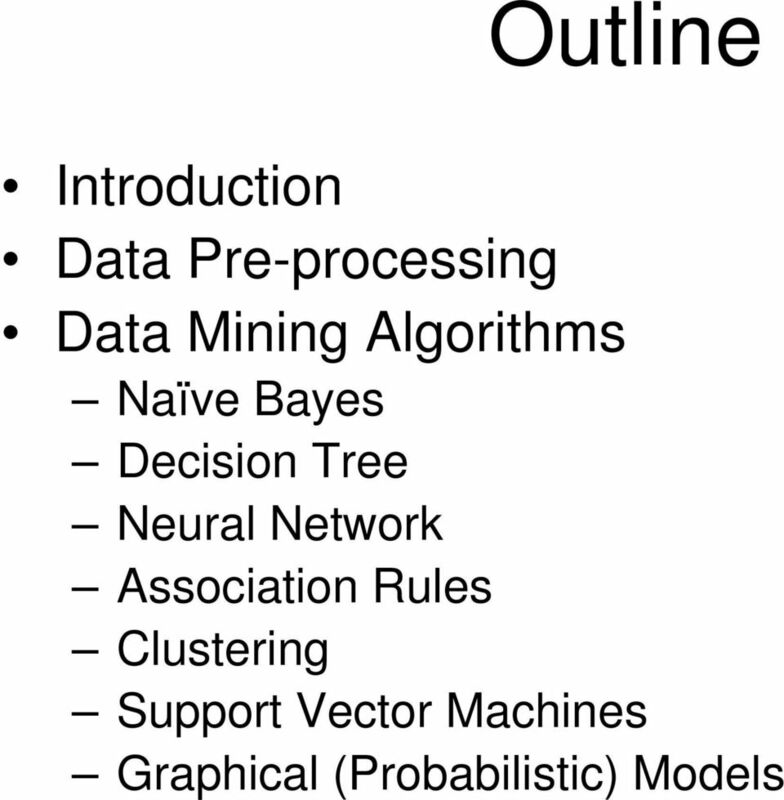 There are many Data Mining algorithms. Scalability of Data Mining differentiates it from statistical and Machine Learning approach, as in Data Mining we deal with huge amount of data. Class 10. Data Mining and Artificial Intelligence. Data Mining. We are in the 21 st century So where are the robots? Class 1 Data Mining Data Mining and Artificial Intelligence We are in the 21 st century So where are the robots? 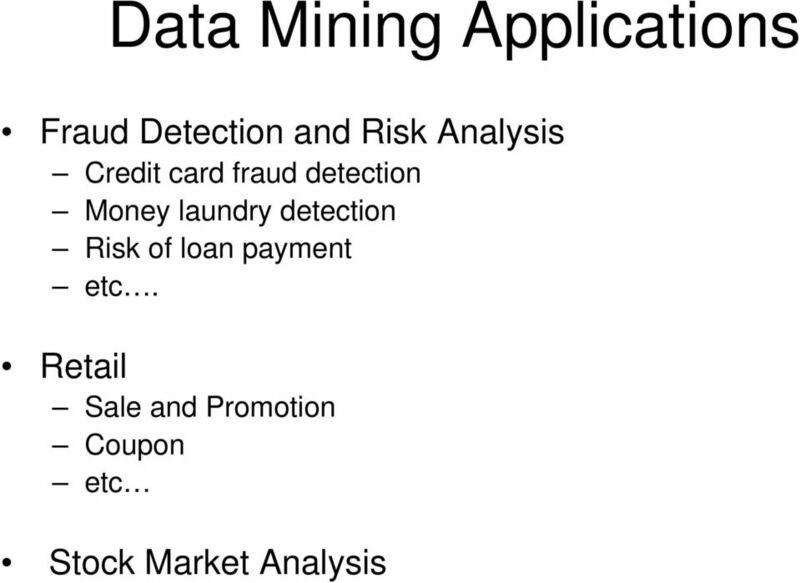 Data mining is the one really successful application of artificial intelligence technology. Decision Tree Data Mining Example from Larson Text By Susan Miertschin 1 Problem The Maximum Miniatures Marketing Department wants to do a targeted mailing gpromoting the Mythic World line of figurines. 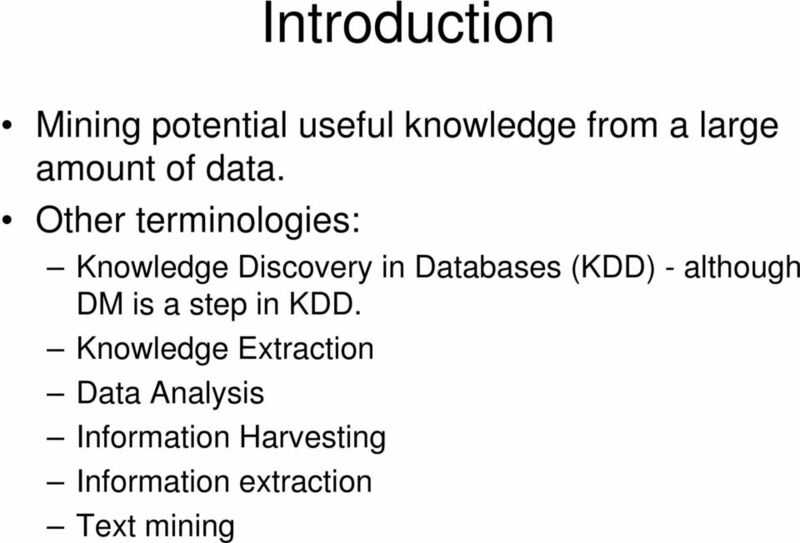 (b) How data mining is different from knowledge discovery in databases (KDD)? Explain. WEB PAGE CATEGORISATION BASED ON NEURONS Shikha Batra Abstract: Contemporary web is comprised of trillions of pages and everyday tremendous amount of requests are made to put more web pages on the WWW.